The XE-A401 cash register is the ideal solution for businesses requiring advanced functionality along with a separate thermal receipt journal. 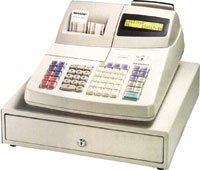 This cash management system features an alphanumeric display for the operator, numeric display for the customer, 1800 price look-ups (PLUs) and an extra-large cash drawer. For ease-of-use, the XE-A401 includes a PC link cable and PC software for simple programming of all PLU, departments and clerks. As a bonus feature, the XE-A401 offer a graphic logo generator to let users add logos & graphics to receipts.